The Cayman Islands are located in what is known as the "hurricane belt" of the Caribbean region, and while the last hurricane to directly strike us was Hurricane Ivan in 2004, we must be ready should another storm come our way. Hurricane season officially runs from June 1 to November 30 each year, although hurricanes have been known to sometimes occur at other times during the year. Hurricanes are also often unpredictable in their paths and intensities, so consistent preparedness is essential in our part of the world. Therefore, CUC maintains a comprehensive year-round preparation programme to guarantee its readiness for hurricanes and other natural disasters. The Company's principal disaster preparation objectives are twofold: to ensure that all practical precautions are taken in advance to minimize, prevent and protect against the risk of injury to staff and loss or damage to CUC's property during a hurricane; and to ensure that a predetermined plan exists for the restoration of electricity in a post-hurricane situation. An integral part of CUC's preparation programme is CUC's Hurricane Committee comprised of key personnel within each operating division. The Committee's responsibilities include ensuring that comprehensive preparation measures are in place prior to hurricane season, maintaining the Company's Hurricane Command Centre (located at CUC's North Sound Road plant) in a full state of preparedness, and reviewing and revising CUC's official Hurricane Manual annually for distribution to staff. Furthermore, each CUC Vice-President is responsible for yearly preparedness as outlined in the Hurricane Manual and for conducting regular reviews of his or her division's activities in this regard. These activities include guaranteeing the availability of generating units, emergency generators, line vehicles and other production and T&D equipment before, during and after a storm; ensuring that the Company's onsite Hurricane Centre (designed to withstand maximum winds of 150 mph) is readily adaptable for emergency usage; and training personnel for first-aid and other safety purposes. 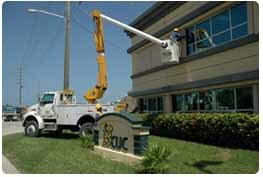 CUC has comprehensive procedures and action plans in place for preparing its staff and plant facilities for an approaching hurricane and restoring power to its customers as quickly, efficiently and safely as possible after the storm has passed.